Alkor Technologies - manufacturer of large number cube beamsplitters. We can make IR or visible polarizing or non-polarizing cube beamsplitter according to your design and coating requirements. This beamsplitter typically made of two right angle prisms. Polarizing Cube Beamsplitters are ideal split unpolarized light into S-Polarization and P-Polarization states. 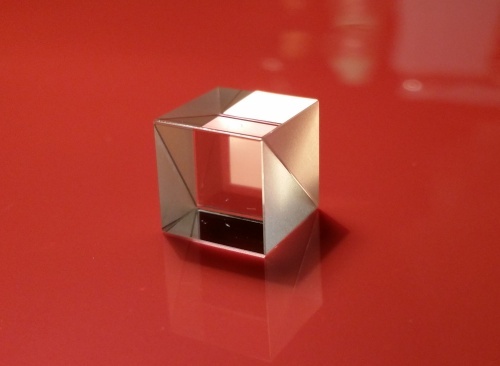 Polarizing Cube beamsplitter can be optimized for a particular wavelength to give superior performance for laser applications. Non-Polarizing Cube Beamsplitter split light without affecting the incident light’s polarizations states. We offer a range of Cube Beamsplitters for scientific applications. Beamsplitters are available for optimal performance in the Visible or Infrared (IR) Spectrum, with anti-reflection coating options designed for popular laser wavelengths or wavelength ranges. Standard Cube Beamsplitters, split light by a percentage of overall intensity. Minimal Order Quantity for not in stock cube beamsplitter - 50pcs. Contact our sales team to get price for your specifications now.